I really like this laptop, it is powerful, and versatile. 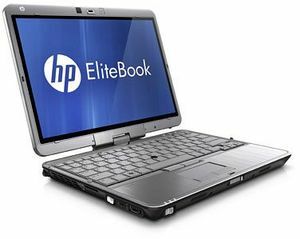 If you travel a lot then the EliteBook 2760p would be great because of its compact size. If you need a tablet, but you also need something more powerful than an iPad or Android tablet, the 2760p would also be a great fit. All in all the EliteBook 2760p will fill many shoes and work well in any situation. However, as tablets become more powerful, computers like this will become increasingly obsolete. The 2760P is a very well executed convertible netbook and was built with an eye for detail. The construction is very solid and the screen is both responsive and offers good viewing angles. The Sandy Bridge platform provides optimal performance with virtually any productivity app, while the battery assures almost all day autonomy. Still, we were a little disappointed by the lack of a USB 3.0 port and about the little build flaw that doesn’t allow you to hermetically lock the screen over the keyboard when in tablet mode. These are not major problems and are easy to work with, so in the end the 2760P is an admirable Enterprise machine. Positive: Strong and sturdy body; Powerful enough; Security tools; Nice features. Negative: No USB 3.0; Battery life; Price.